The waterfall is open from 6:30am to 6:30 pm. We arrived at 9am on a Friday and there were already many tourists there. To get this waterfall all to yourself, you need a bit of luck and probably to arrive right when they open. The entry fee is 15k per person plus an additional 10k if you wish to reach the upper level of the falls. Parking for scooters is free while car parking is 5k. You can also choose to pay 25k to swing at the swings at the base of the waterfall. After buying your ticket, you follow a pathway lined with tourist shops and reach a beautiful viewpoint of the waterfall from above. To view the massive waterfall up close, you descend roughly 100 steps. Depending on when you go, the water might be too forceful to swim directly under the falls or to swim at all. If the water is relatively tame, take a dip in the refreshing cool waters while surrounded by lush greenery and mountains. Slowly meander back up the 100 steps to exit the way you came. 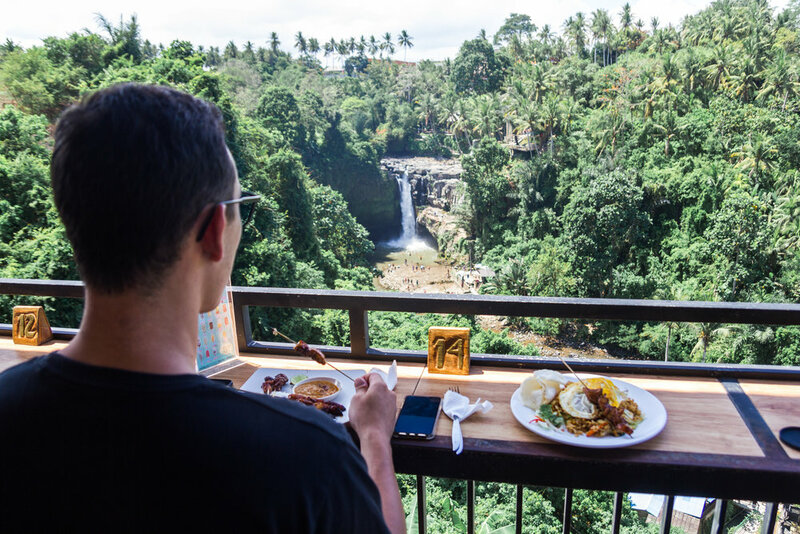 If the stairs have made you hungry, stop at one of the cafes at the top to take in some final views of these astounding falls over a Nasi Goreng (35k) before you go. Have you visited Tegenungan Waterfall in Bali? Let us know about your experience in the comments below!